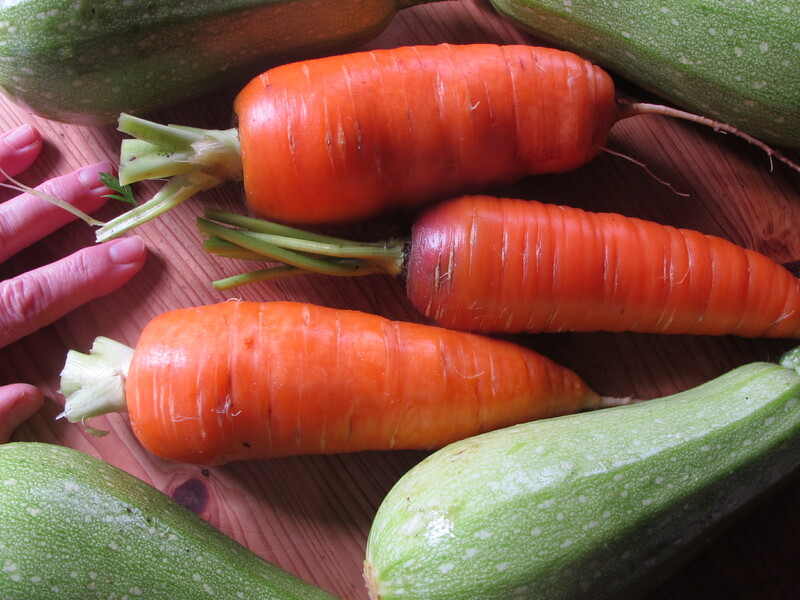 A world tour of our garden, in 3 meals. 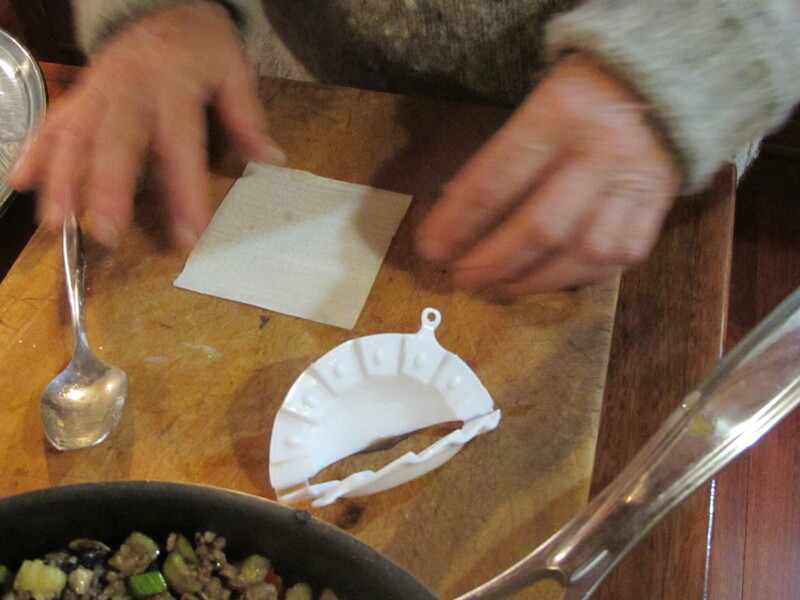 Breakfast, Lunch and Dinner, a world tour of our garden, in 3 meals. Gardening is a very enjoyable activity. It gets us out into the fresh air, it’s good exercise and It provides most of all we eat each day. 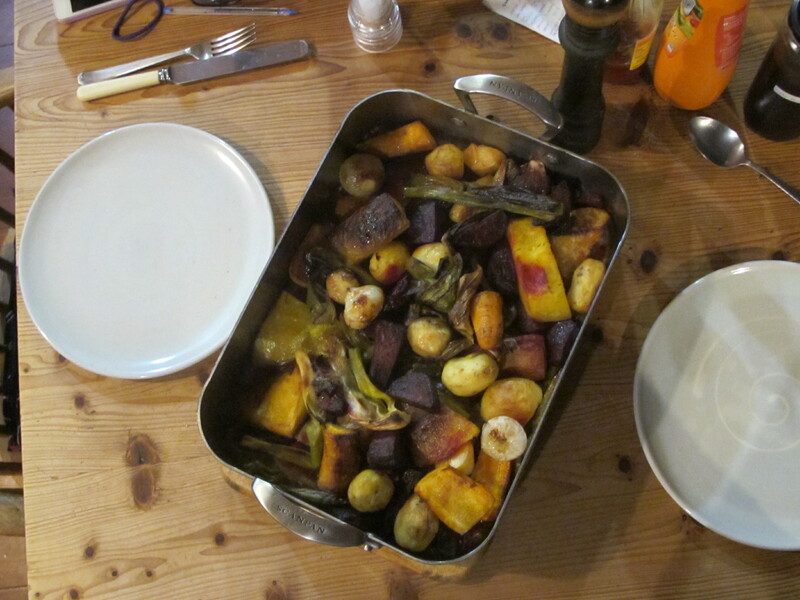 As the autumn progresses towards winter, the cooler weather encourages us to seek out more warming cooked meals. We indulge ourselves in reflecting on the people and places that inhabit our collective memories. Our conversations trigger memories of these people and places. Fond recollections of some past events and friends remembered through pots and food. 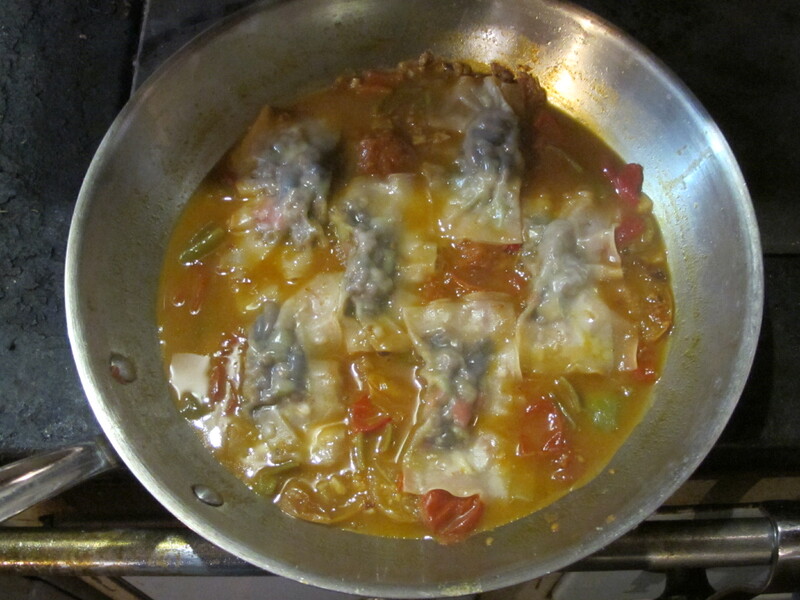 We don’t attempt to make Italian, Spanish, Japanese or any other type of national cuisine. We make Australian food. Real food, home-grown, eaten fresh where possible, but when preserved, we do it without any added chemicals or preservatives. Preserved in glass jars, not plastic. and all home cooked. We just take the influences that we recall and weave them into our dietary choices, them combine our thoughts with what we actually have available to us from the garden. This is what happened yesterday, in between, potting, gardening, wood cutting, kiln building and building maintenence. There is time for everything, in its own time. For breakfast I cooked eggs in passata with a few cloves of garlic warmed in good olive oil first. 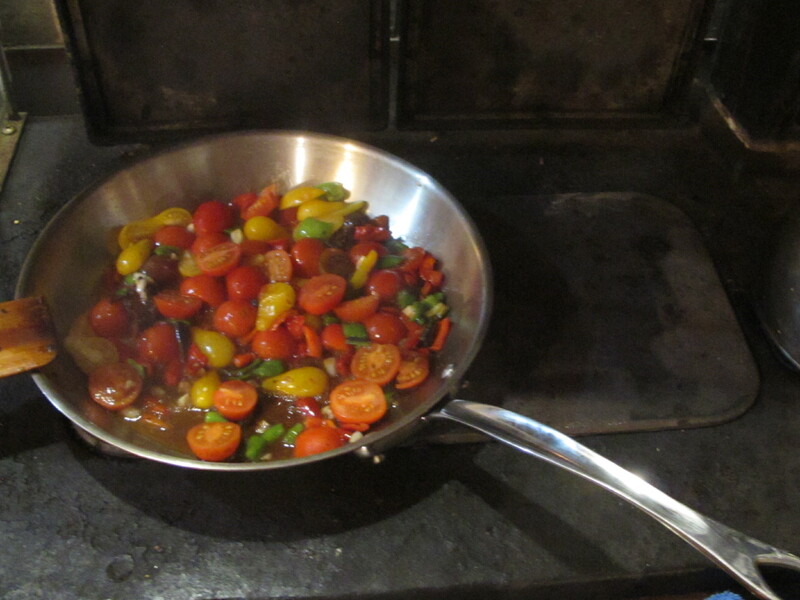 The passata I used on this occasion was made from little yellow, pear-shaped tomatoes that I preserved a couple of months ago, at the height of summer. 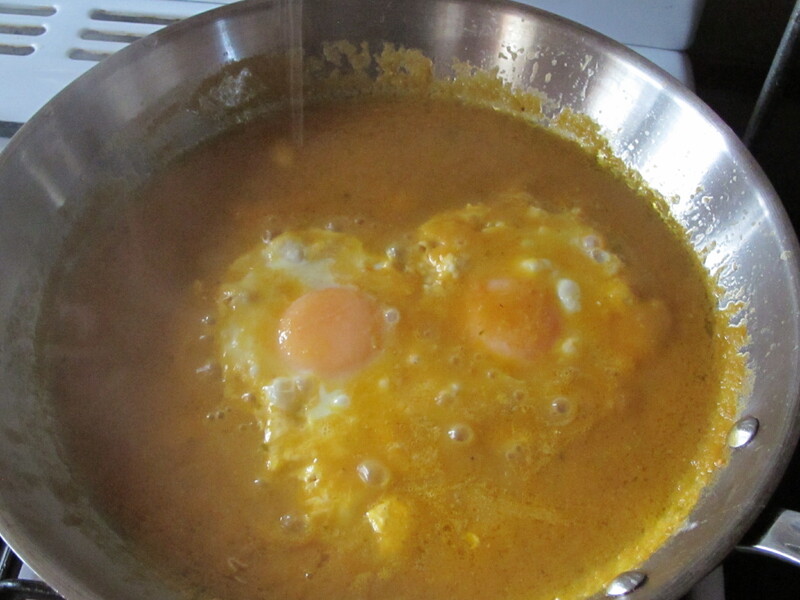 The passata is heated up and the eggs cracked in and covered to gently simmer until the whites are firm. I served it up on a piece of rye sour dough toast. I must say that it was just right for a cool, misty, foggy, morning breakfast. A little cracked pepper makes it perfect. 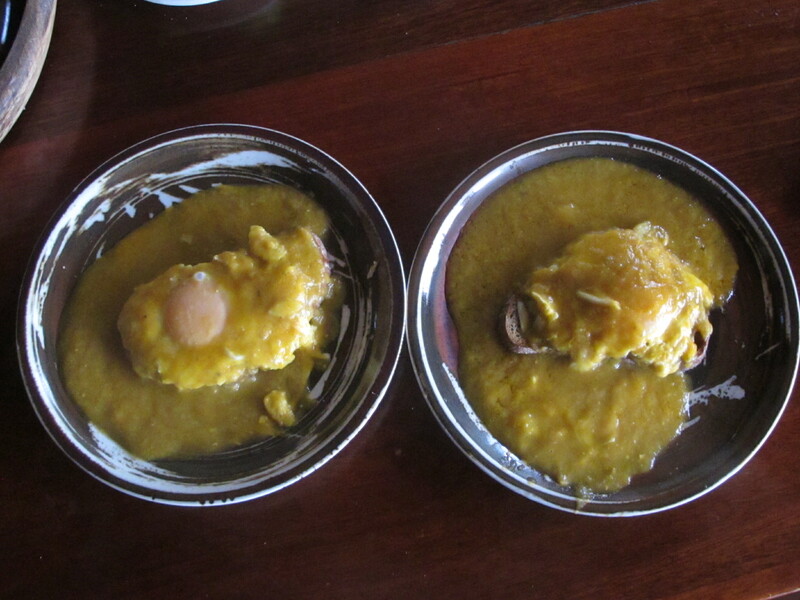 We don’t quite lick the plates, but there is certainly nothing left. For lunch I made and hotch potch from the left over baked vegetables that Nona Nina made for last nights dinner. Brussel sprouts, parsnip, leeks, carrots, pumpkin, onions, zucchini and beetroot. 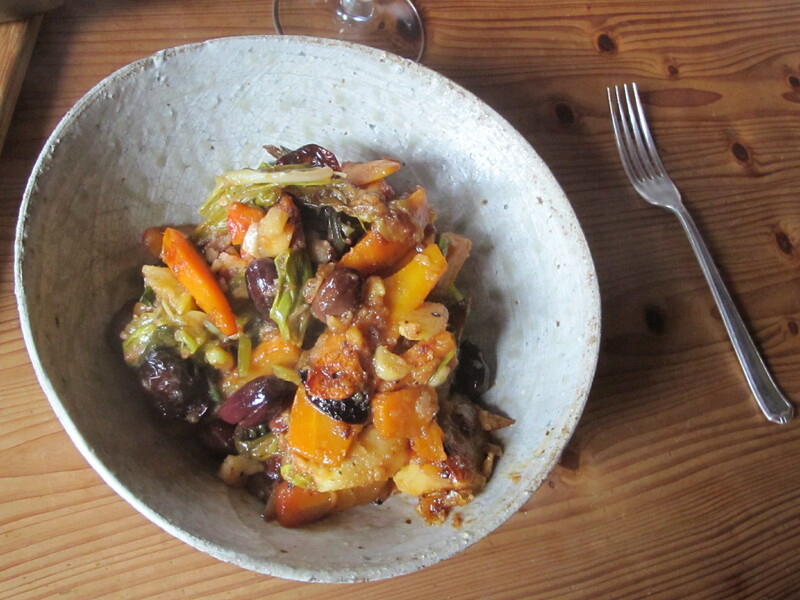 We had that garnished with preserved spicy plum sauce from our summer orchard fruit. 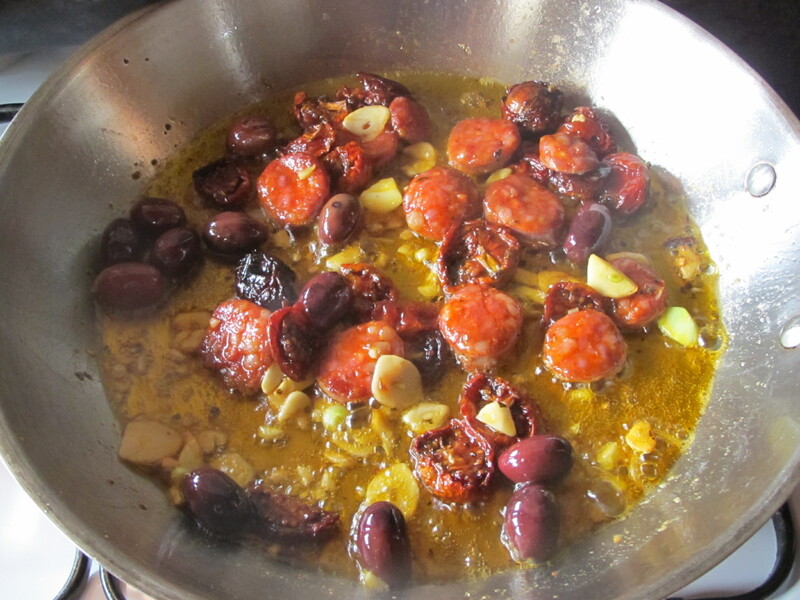 These left-overs were added to some chorizo sausage, our garlic, olives and home-made dried tomatoes from the summer excess. A lovely way to use up everything that we have in different and interesting combinations. We haven’t bought any meat since Xmas as far as I can recall. We aren’t vegetarians, but we don’t eat a lot of meat. 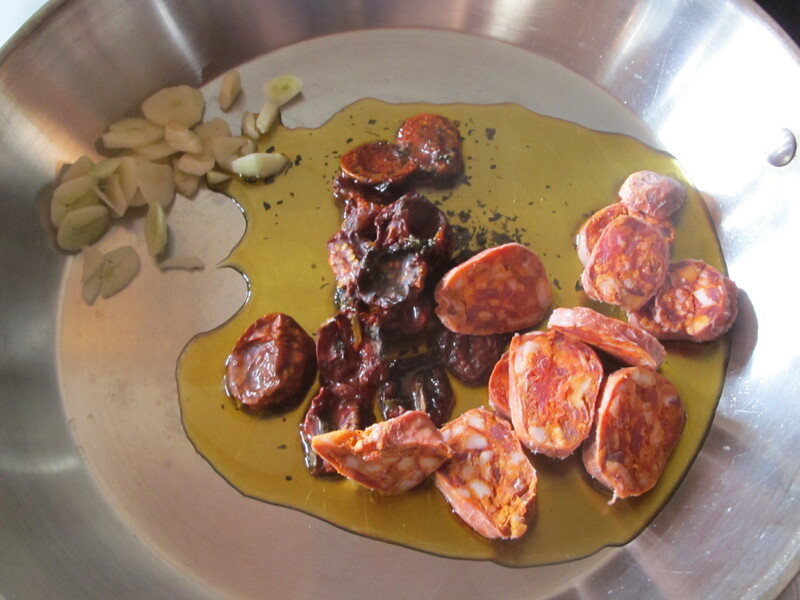 So this is our little indulgence, veggie hot-pot with chorizo. Hot, spicy and nicely warming. For dinner we decided to have Gyoza. I had previously bought 500g of lean pork and asked the butcher to mince it for me. I divided it into 4 parts and froze 3 of them for later. 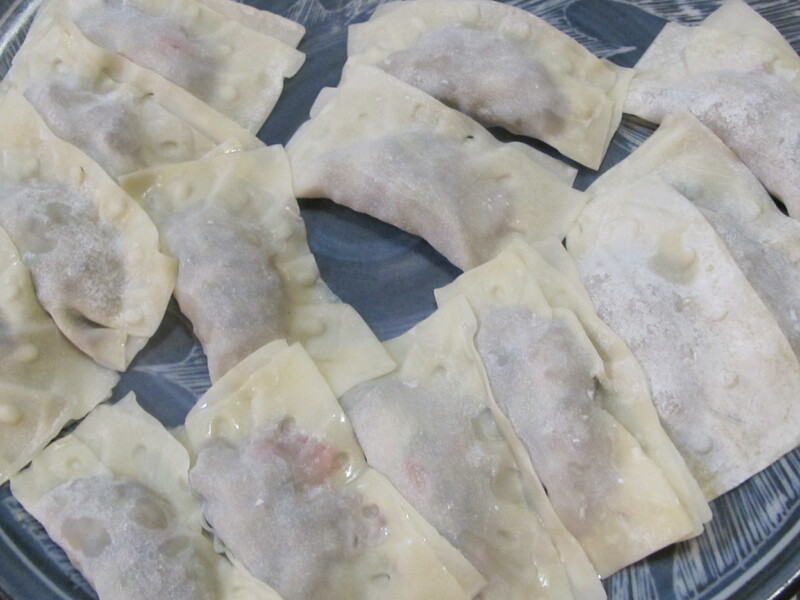 The 125g of pork mince is just the right amount to make gyoza for two. 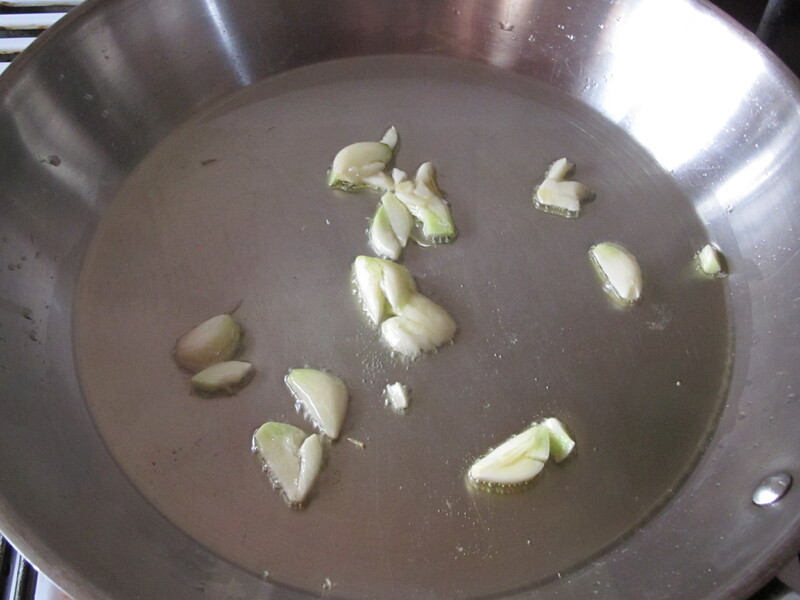 We fry the pork with lots of garlic in olive oil and some finely diced garden veggies. 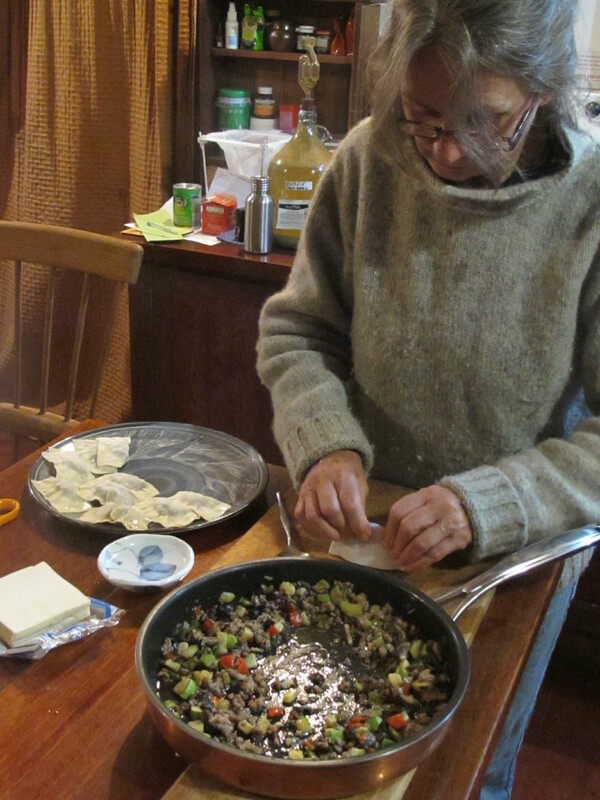 Then Ninako fills the small parcels with the mixture and I simmer and steam them in a sauce made from the last of the small red and yellow tomatoes from the garden, a few beans and some chillies. 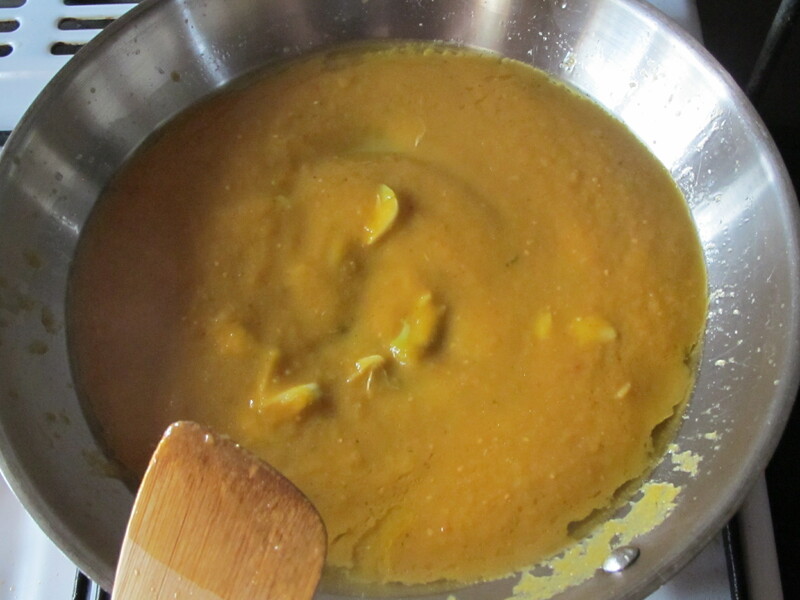 When this is reduced down, it makes a delicious simmer sauce. It all mellows out very nicely. 7 each is just the right number of gyoza dumplings for one hungry potter. 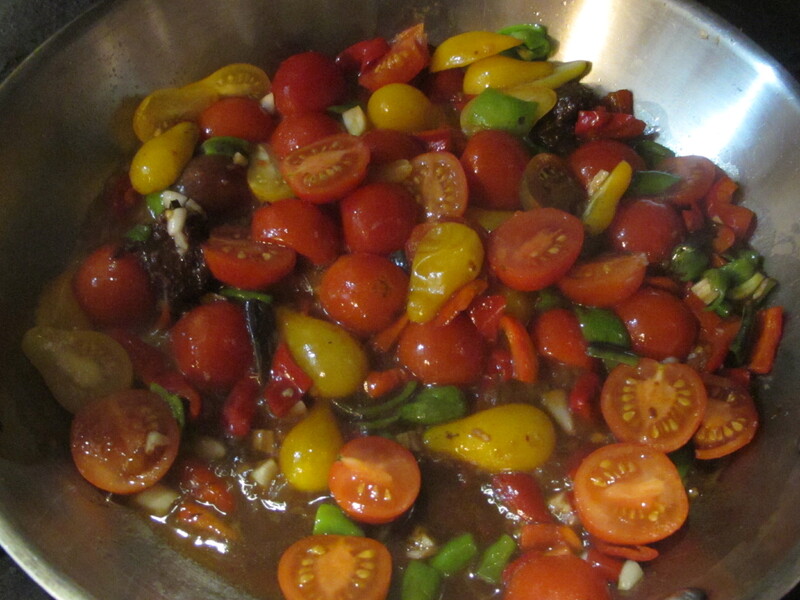 This sauce, although not culturally authentic, is very well matched to what we are enjoying, and most importantly it is entirely ours, from our garden. This is our Australian ‘gyoza’ influenced local dumpling experience. I’ll have another go at it some time in the future, and I’m sure to enjoy that too. Nothing is ever finished, nothing is perfect and nothing lasts. This meal certainly didn’t! It’s such an indulgence to tour the world of our recollections with such wholesome and tasty food, and almost entirely from our own produce. We are very lucky people and I am grateful. I believe you will have heard about the recent devastating earthquake in Nepal. With the help of Vicki Grima, The Journal of Australian Ceramics editor, I am organising a fundraising project called CLAY FOR NEPAL (#clayfornepal15) to raise funds for the Nepalese people affected. The first part of the project is an AUCTION of ceramics from around the world. In conjunction with the AUCTION, Adriana Christianson, has offered to help me organise a BUY NOW STORE offering more affordable items for immediate purchase. Both events will be happening from Friday 15 to Sunday 17 May 2015. All funds collected, less any event expenses (eBay and Paypal fees), will be donated to Oxfam, Nepal Earthquake Relief Appeal. Vipoo Srivilasa is authorised by Oxfam Australia to collect funds for the benefit of Oxfam. Vipoo is a very nice and thoughtful bloke who has taken on this endeavour of his own volition. It’s a credit to him and I am proud to be associated with the enterprise. Janine and I have donated cash through the Red Cross, but this is a way that we can do more, by doing what we do best. Which is making beautiful, thoughtful, meaningful objects. Stevbu and Ninako, gardeners of local produce and international flavours.